Inspired by these lessons from our Sages, I began to experiment with different challah recipes. I thought about how my grandmother probably learned this tradition from my great grandmother, and she from her mother. As I stood in my kitchen measuring, mixing and kneading, I felt connected to these matriarchs of my family. It was as if they with their wisdom and whispered prayers were standing beside me. By baking this bread I became a link in a holy chain that connected me to the generations of women who prayed their offspring would hold fast to Torah and mitzvos. This chain ultimately reaches the matriarch Sarah Imenu, the grandmother of us all. (I hope you'll come back here soon, and read up on what's so special about challah—you won't regret it!). The verse above says, “blessing is found in the home only on account of his wife.” Our sages say that “his wife” is Sarah. Sarah understood that she could invite G-d in and bring His blessing into her home through her actions. She prayed for His involvement in every task she undertook and thanked Him for His constant closeness. Since she attributed her every accomplishment to the help of Heaven, her home received physical blessings that were beyond the properties of the natural world. 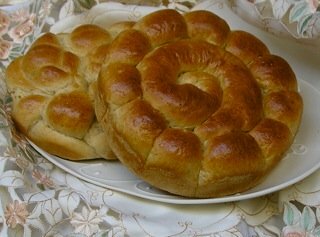 For instance, there is a story that says when Sarah took challah and baked for Shabbos, her bread remained oven fresh throughout the week. And even though Avraham and Sarah never knew how many guests they would serve each day, the same amount of that delicious bread managed to satisfy the many travelers her husband brought home as well as the members of their household. Because we descend from her, the miracles of Sarah’s bread remain accessible to us today. When we properly perform this mitzvah and bake bread with this this deeper understanding, we acknowledge Hashem as the source of blessing and physical abundance in our home. It is an opportune time to talk to G-d and pray for His assistance as we stir, knead and shape the basic ingredients. This is a partnership that transcends the physical. When two fresh loaves crowned with a beautiful cover adorn the Shabbos table, we see before us the elevation of the mundane to the majestic. Bread, the basic human food, becomes the first bite of Shabbos that we delight in: the appetizer for 25 hours of a taste of the World to Come. 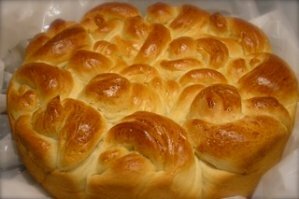 The Cooking for The King Recipe for Challah is about much more than its mixture of flour, water and oil. Interspersed within each step of the recipe are entreaties asking Hashem to bless us with His constant love and generosity. You may choose to use your own recipe, and since these entreaties are not formal prayer, insert your own heartfelt conversation with Hashem at this time. Baking bread in our home is an excellent opportunity to recognize G-d’s involvement in every area of our lives. With Hashem’s help, the noble intent of our actions creates an environment where all who enter can develop a personal relationship with their Creator. This was the model of Avraham and Sarah. Like Sarah’s bread, which remained fresh from week to week, the prayer and mitzvos we bring into our home influence and sustain us, from generation to generation. May observing the mitzvah of challah with these thoughts in mind, serve to strengthen an enduring connection between you and G-d—and enrich your home with the Majesty of His constant oversight and help.